Life has a certain rhythm. But nowhere does the rhythm of life become more evident than at the heart of two fields very near and dear to me: horology and rock music. Well, right at this moment in time they have two seemingly disparate Swiss made references welding them together: Paiste and Corum. Sometime around Baselworld 2015, an employee of Corum – who also happens to be a drummer – saw an ad for a Paiste cymbal in a music magazine. The ad compared the precision of the Swiss-made music instrument to the precision of a Swiss-made watch movement, and a light bulb went off in his head: wouldn’t a cymbal look great as a dial on a Corum watch? This idea born of passion became a reality when both the watch company’s upper management and Erik Paiste, owner of the century-old cymbal maker based near Lucerne, concurred. It was quickly decided that the iconic look and experimental, artistic feel of the Bubble, with its 47 mm case and high eight-millimeter sapphire crystal dome, would be best suited to accommodate the typical look of a cymbal. “The way that Paiste manufactures its cymbals is pure tradition – and an excellent example of craftsmanship as it relates to ‘Swissness’,” Antoine Hastoy, product and marketing manager at Corum, enthusiastically explained. Indeed, after touring Paiste’s factory, the common appreciation of beauty, precision, and hand-accomplished craftsmanship that the two companies share became very apparent. The Paiste cymbal is crafted from a normed bronze alloy known as 2002 bronze (CuSn8), which contains 8 percent tin (Sn) and other elements such as iron, phosphorus, zinc, and lead in addition to the main element, copper (Cu). This type of bronze is also used for coins, power conductors, marine components (it has excellent resistance to corrosion), and various automotive and industrial parts. And by now you may have guessed that occasionally you can also find it in watches. And one watch in particular has 2002 bronze in its dial: the Corum Paiste Bubble. This Bubble’s dial looks like a miniature cymbal, and the processes used to make it almost precisely mirror the process utilized to make a cymbal at Paiste – just at a different scale. The sized and tempered bronze of the cymbal – which has received its center bell shape with a hole punched in that first step – is hammered using a foot-operated pneumatic hammer for initial shaping. The craftsmen in their sound-insulated cubicles move the bronze disc under the forceful hammer just as if it were a plate to which a watchmaker would apply perlage. The spacing and pattern is that precise – and the process is not dissimilar to applying perlage. After the cymbal-in-the-making is tested for truth in the round, it is sent back upstairs for lathing. The lathes at Paiste look much like rose engines in the watch industry, and their functions are not so dissimilar either. 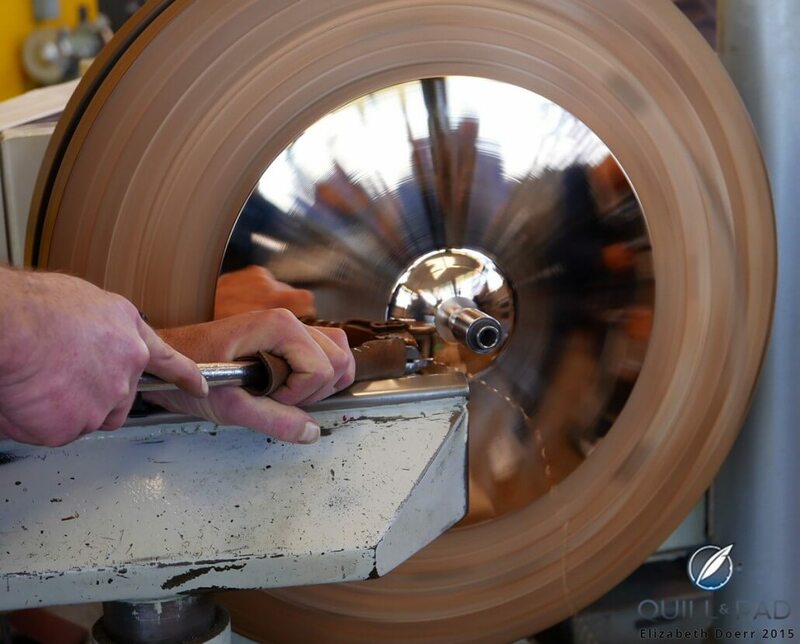 The lathe is what creates the grooving in the cymbal, which is the visible effect of reducing the thickness of the material. The sonorous bronze is intentionally left thicker in the center, gradually getting thinner as it gets closer to the edge. The look of the Paiste Bubble’s dial is a direct result of Corum executives visiting the Paiste factory, watching the cymbal-making process, and reporting back to the dial maker. The dials are made the same way, just on a smaller scale. Just like making a real cymbal at Paiste, Corum’s dial maker chases the bronze plate by hand with a hammering tool, though a much smaller one. The bronze Paiste Bubble dial is completely finished by hand using a satiné circulaire pattern to emulate the grooves that the large lathes leave behind on the cymbals. “Since the start of the project, the dial was supposed to look like a cymbal,” Paiste explains. “As we worked on it, secretly I was a little worried because I didn’t know how they’d achieve it. Were they going to silk-screen something and be done with it?” he laughed. 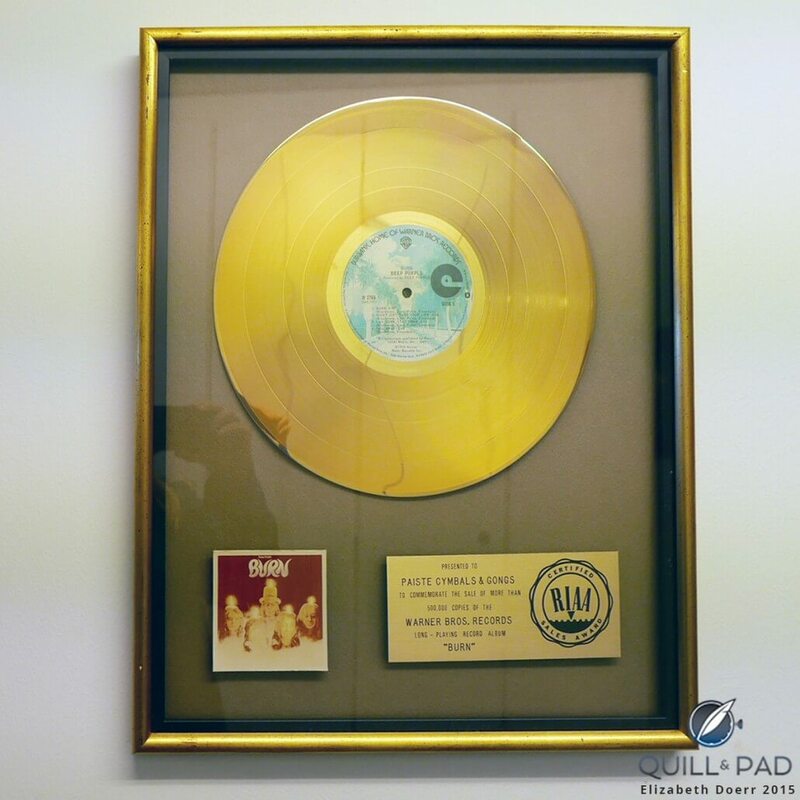 Paiste, which can well be said to manufacture sounds in addition to musical art in bronze, was involved in the creation of this very special black PVD-coated Bubble. Erik Paiste, who is very meticulous in everything he does, personally approved the design and aesthetics of this 350-piece limited edition piece. The Corum Paiste Bubble has already arrived at authorized Corum retail locations. However, the first two editions of this tempo-loving wristwatch went to two very special people: Erik Paiste (naturally) and Ian Paice, the iconic drummer of Deep Purple. Indeed, Paice can well be called one of the best drummers working in rock music – and that for the last 46 years. 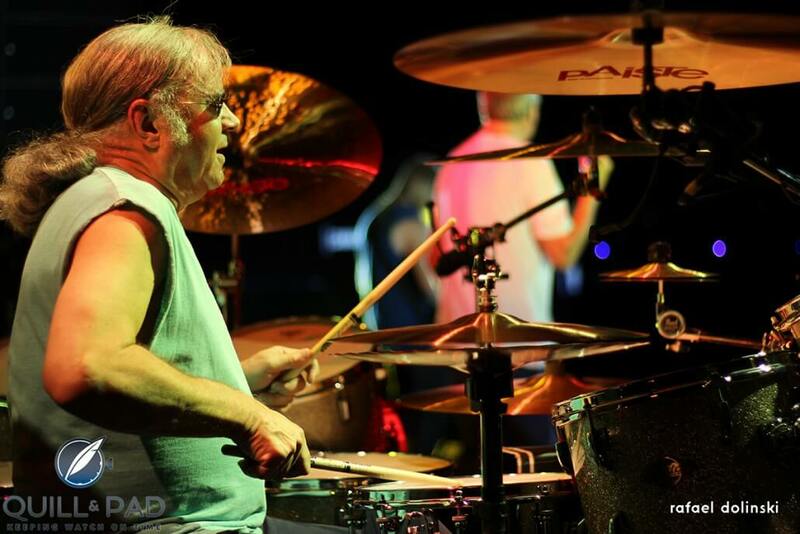 The self-taught Paice is the only member of Deep Purple’s historically evolving lineup to have played on every single one of the band’s albums – as well as several Whitesnake and Gary Moore albums. His unschooled drumming style has allowed him the freedom to make his mark from behind the kit, something that very few drummers are able to do. “When I started picking up my mother’s knitting needles to pretend to be a drummer [before the age of 15], all the different influences – including from my father’s big band swing piano – were going in, and the only way I could translate it was to channel these same influences out,” Paice explains the significance of his background on his playing. “When I started playing drums properly I was playing rock and roll, but I was playing it like a big band drummer would play, and I’ve never changed that,” Paice continues with regard to his signature style. Additionally, Deep Purple, which was formed in 1968, came of age at a time when rock and heavy metal music were really starting to come into their own. And within the genre, Deep Purple had a different sound than other bands – thanks in great part to the Hammond organs used by keyboarders Jon Lord and Don Airey, but also to the unique talents of the individual members and how they sounded as a whole. 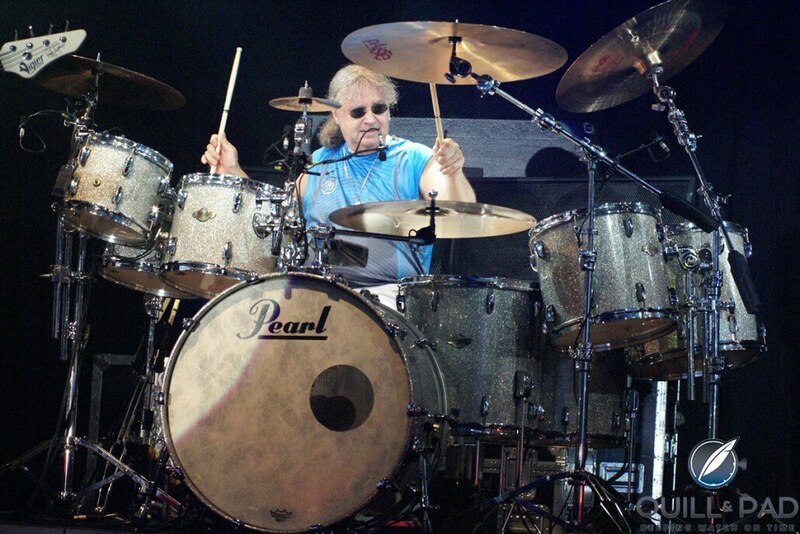 Having dependable and well-designed instruments means a lot to Paice, which is one of the main reasons he has been a Paiste ambassador all these years. The reason that Paiste can offer such thorough quality is down to its “normed” production process, which includes a final quality control of each and every cymbal by the hand and ear of a trained QC professional. The drummer is the time-keeper of any band. His or her job is to keep the beat that drives the music, keeping the various players on the same page to secure time, ensure dynamic intensity, and a add a feel for the music and musicians that will make a song that may have incredibly interesting individual elements come to life as an ensemble. Drummers also punctuate the music and change it up, very often by using cymbals. It’s a good thing, though, that cymbals are physically bigger timekeepers than watches – it seems if they were any smaller, Paice might well be able lose it. In preparation for the interview with Paice and the ensuing concert, I picked out some older albums from my early Deep Purple “phase” to listen to for a few weeks in the background, just to get my musical memory jogging. It was during this period that I discovered a light beat with the cymbals on a live version of “Child in Time” that suddenly entered my consciousness through the haze of watch stories I was writing: it sounded just like a clock ticking! Listen for yourself right here, it starts at around six minutes. Paice explains the passage where his drumsticks lightly tap the Paiste cymbals, which to me really ends up sounding like pallets clinking against the escape wheel when you put your ear to your watch. “Sometimes you have to just keep a very simple time for some pieces of music where there are big holes so the other guys know exactly that this is where we are, together. And it is just like a second hand, just going around, yeah,” he confirms. “You know, you are the timekeeper. You are the metronome of the band, and you have to give little signals so that everyone knows that’s the beat, the next one’s going to come there,” the iconic drummer continues. The way that Paice explained this to me was utterly charming – which is hard to reproduce in black and white. So if you’d like to hear him explain this in person, please click play on the left of the sound player above to hear the original interview excerpt. For more information on the Corum Paiste Bubble, please click the link to visit the dedicated Bubble mini-site.